Create an interesting print ad to introduce the new Pringles flavor Chili & Sour Cream! Pringles decided to innovate with a new delicious flavor that you’re going to be mad about: Chili & Sour Cream! Can you imagine how incredible this new flavor is going to be? Your job is to get the word out and make sure that everyone tastes this awesome potato chip! You need to convince everyone to give this incredibly tasty, new snack a try, through creativity and originality. 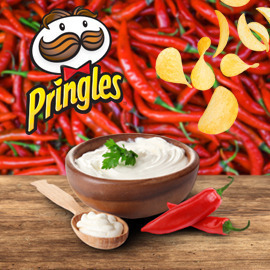 The challenge is to create an interesting print ad that convinces snackers everywhere to try the new and amazing Pringles flavor - Chili & Sour Cream because it is the ultimate premium taste and fun! Click here to see the full brief! Best of luck to all of you!